I’m jumping ahead to Spring with these happy colors. I finished this quilt top in October and I’ve slowly been ticking quilts off my to-finish list. A funny story about this one….a certain 2 year old in my house took my tiny thread snips to the corners of this quilt while it was folded on my table. I didn’t even see her do it until I went to baste the quilt and noticed the corners were hacked to pieces! Luckily she only cut the corners, so I was able to save it by giving the quilt rounded corners. Also luckily she’s really cute and can do no wrong (and she didn’t hurt herself!). 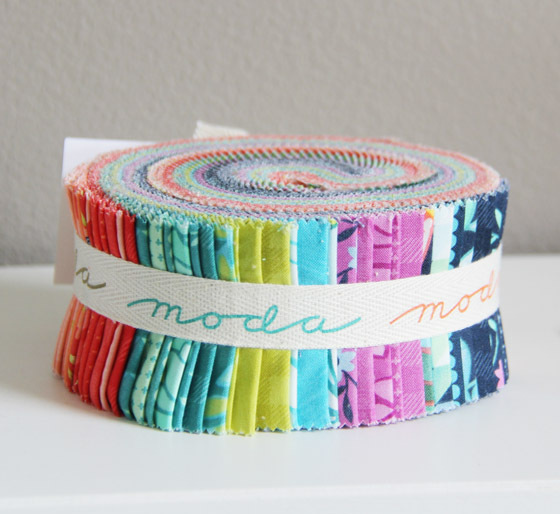 I used an older jelly roll by One Canoe Two for Moda called Tucker Prairie. The pattern is my Simplify pattern in the throw size (pdf pattern here, paper pattern here). I free motion quilted this with loops, the backing and binding are from my Hello Jane fabric line. Normally with the rounded corners I’d use a bias cut binding, but since I already had the binding made before I realized I’d need to round the corners, I just went with it pinning and going slow. 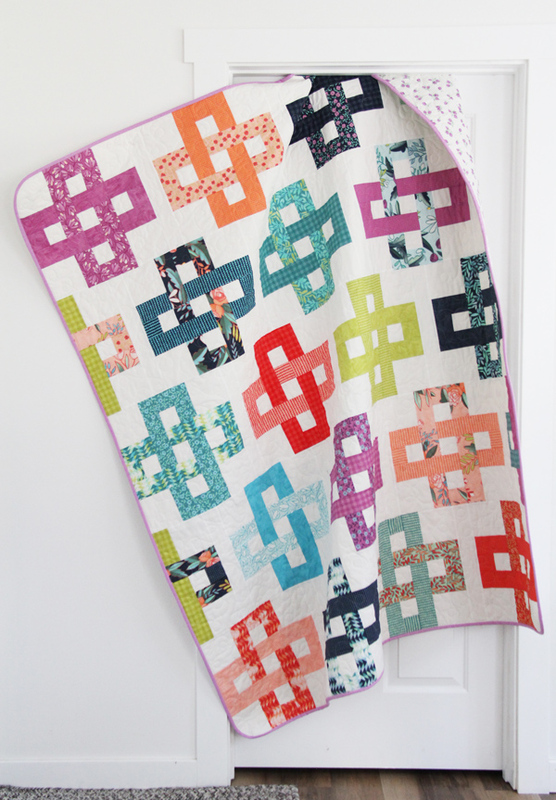 I love the way it turned out, maybe even more than the original quilt I made for this pattern! It’s almost March!!! 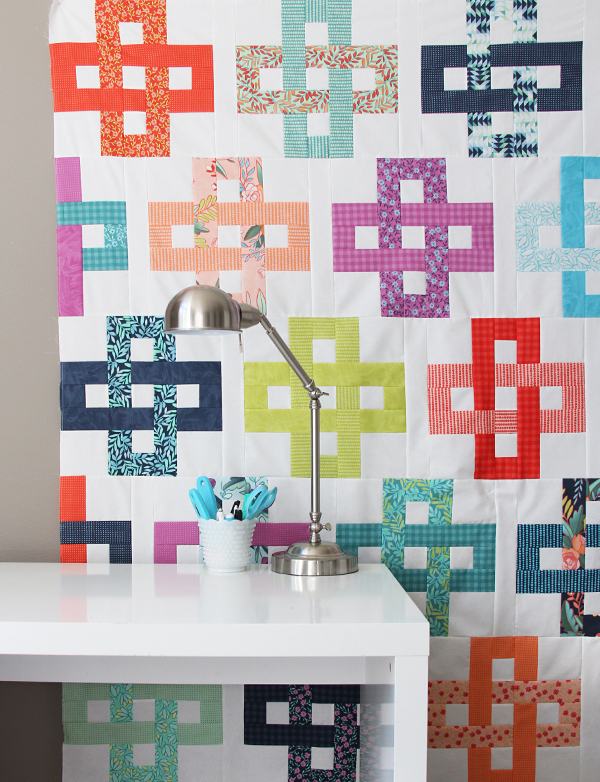 If you are sewing along with me making Shimmer Blocks, you should be almost done making 4 blocks for February! If 4 blocks feels like too much for your or you are feeling overwhelmed…just make one or two blocks a month. Remember just to have fun with it and learn as you go, and don’t put pressure on yourself to keep up with me or make your blocks perfect (mine are NOT perfect). In March we’ll make 4 more blocks, so do what you can! The Shimmer pattern is still on sale until March 1st if you still want to join us…you’ll only have 4 blocks to make for February (or just make one extra block the rest of the 4 months!). I realized after I made my 4 blocks that I need to lay off the yellow in my next blocks. 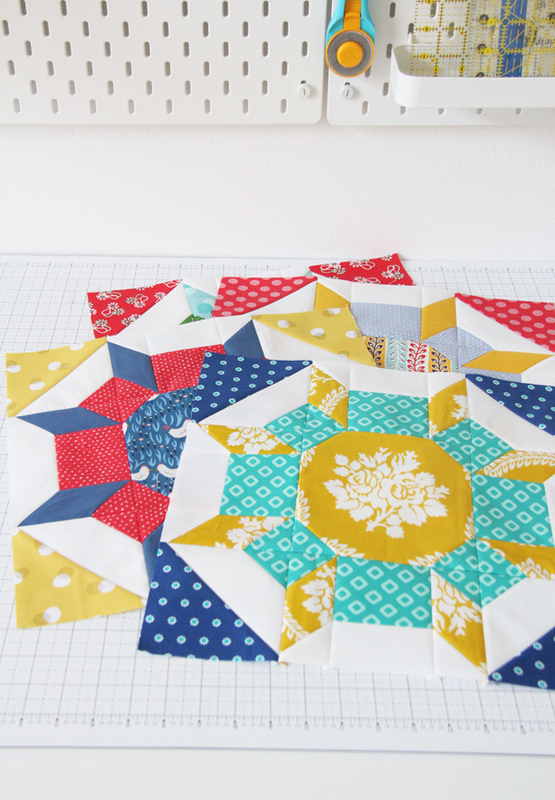 I love yellow but these blocks are BRIGHT together. Happy Shimmer-ing! I get so many questions about sewing machines, and honestly I am NO expert on sewing machines, I only know what I have! 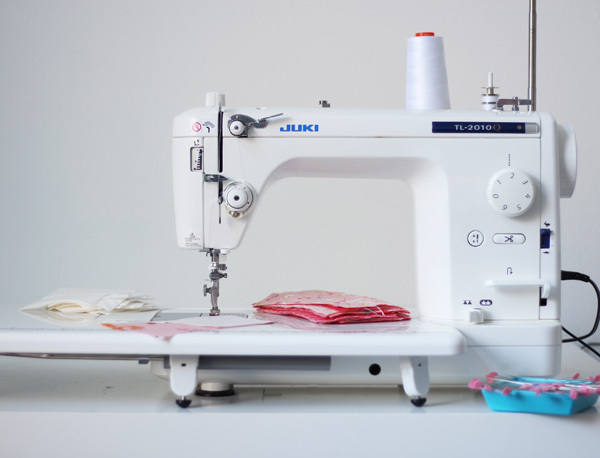 So I thought I’d write a quick update about my sewing machines, what I’m using and what’s working! Here is my last post 4 years ago that is more in depth with more links. Last week I was answering an email with questions about my Juki and I told her I’ve had it for a “couple of years“….then she emailed me back after reading my first post about it and said….”actually, you’ve had your Juki for 4 years“. Whoops! And that’s why I blog….because I can’t remember ANYTHING unless it has been documented. So…I’ve had my Juki for 4 years. I still LOVE this machine. I’d buy it again in a heartbeat. I have had zero problems with it…but this is also my second machine. I had my first for a couple of weeks before I broke it and sent it back for a replacement within the warranty. You can read all about that at the bottom of this post. I purchased my machine here (I think SewVacDirect also sells directly on their website) and I would highly recommend buying an extended warranty. I bought this machine for $975 at the time before tax. I have no plans to upgrade or change machines…this baby should last me many more years (knock on wood)! What I love about this machine: It is fast, it is reliable, it’s very low maintenance, it has no computerized mechanisms I worry about breaking, it still has the needle down and thread cutter I love, it free motion quilts like a dream with a much larger throat space, it’s powerful when sewing through multiple layers, and it’s very easy for my kids to operate and sew on now that they are more interested in sewing (this model has the speed control, so I can turn the speed dial all the way to slow and it’s perfect for kids). It’s just a great, basic, non-fussy, powerful machine. What I would change about this machine: The walking foot is still loud, clanky, and really a pain to use. I rarely use it, but on the plus side this machine is so powerful that I can bind quilts without the walking foot without any issues or dragging. The tension is the main problem I’ve heard with Juki’s, and if it gets off it’s really hard to get back to perfect. I’ve never had serious tension issues, but there have been a few times my kids have turned the tension dials just for fun and it’s a nightmare to re-adjust. Also it’s annoying there is no zig zag stitch, this is only a straight stitch machine. Luckily those have been very minimal things and are the only things I dislike about this machine (and maybe the walking foot issues have been fixed since I bought mine 4 years ago?). Okay so I have to first say that my Bernina 440 is about 7 years old, so there have been great improvements and changes to the newer models. So take what I say with a grain of salt…but also it’s nice to know how your machine will hold up after 7 years and millions of stitches! 4 years ago this was my main machine and my Juki was my “once in awhile” machine…and now they have changed roles. I hardly ever use this machine! I do use it for all of my decorative stitches, and lately it’s been sitting on my dining room table while I quilted a bunch of quilts using the a wavy stitch with my walking foot (Bernina stitch 4, width set to 5, length set to 3). But before last month it had been in my closet for maybe a year or more untouched (I hate typing that but it’s true!). What I love about this machine: It is so reliable, and makes a perfect stitch every single time. Also it has never once has tension issues like the Juki. I love using the walking foot on this machine, and it’s quiet and pulls the fabric through like a dream. What I would change about this machine: My light went out in this machine, and after taking it all apart they figured out it was a motherboard issue, and to fix it I’d have to have the motherboard changed. So my light doesn’t work, but I have an external light attached to it that seems to work fine. It seems really slow after stitching on the Juki, it would be too slow for me now if this was my only machine. The throat space is so tight, so it’s tricky to push a full rolled up quilt through it. Basically the same things that I didn’t like before I still don’t like, but they didn’t bother me before I had the Juki and realized the difference. Newer Bernina’s have larger throat space and are faster, but they are also thousands more than the Juki. My Mom has a Bernina 750 and it sews like a dream…but it also has way more functions than I would ever use. 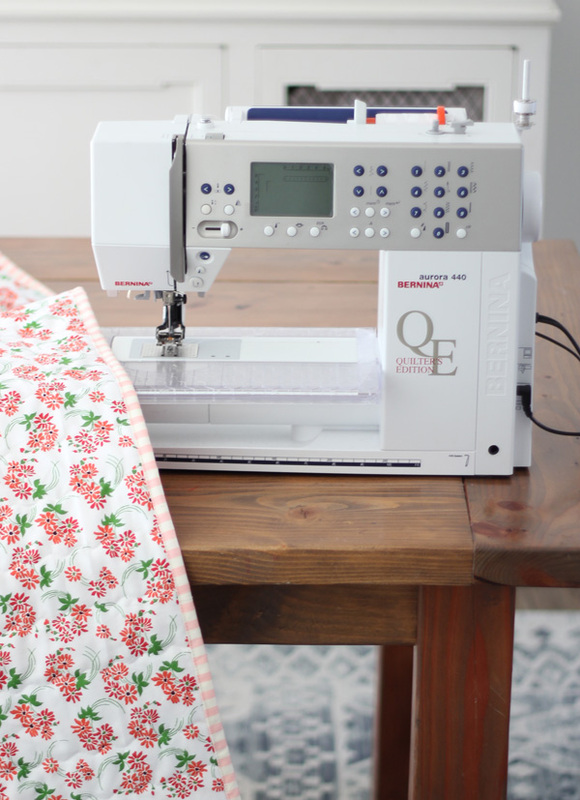 Anyways…those are my long winded thoughts about my sewing machines. I love them both, I use them both, but now I’ve used the Juki as my main machine for 4 years. I also have a Bernina 1008 I was gifted when I got married, and I only pull it out when I travel or teach youth how to sew, etc. 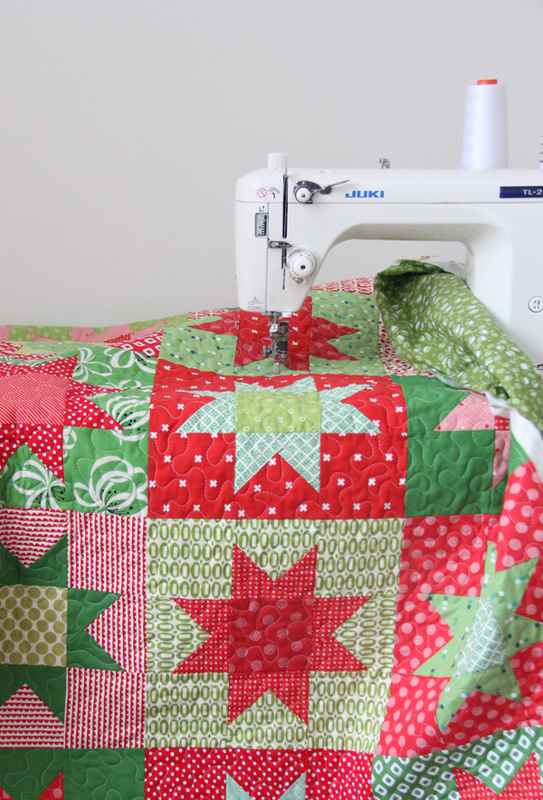 I’ll leave you with this stack of Gretel by Amy of Diary of a Quilter that is on my cutting board today. I have it all cut up into squares now to sew back up again! I’m not a huge fan of all the red and pink (my husband is rubbing off on me!) 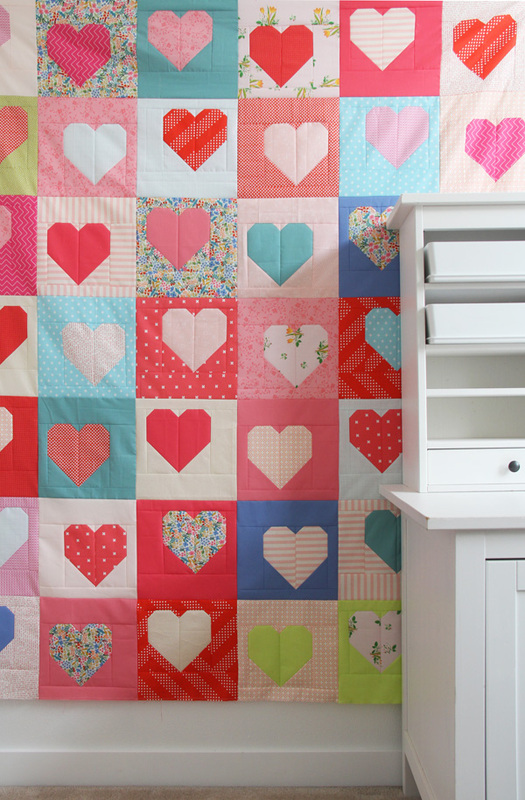 so this quilt is hearts with a punch of color! 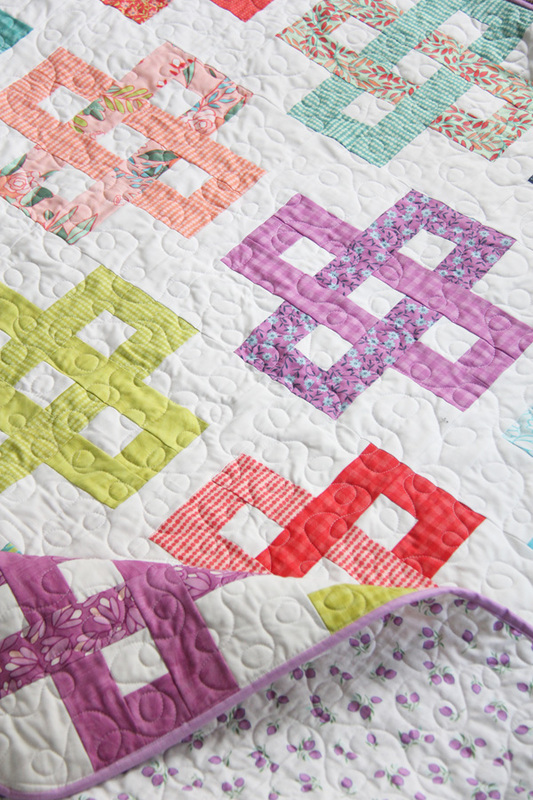 I love quilts like this with no background sashing fabrics (sewing sashings is the worst! ), and a minimum of adjacent seams to match. 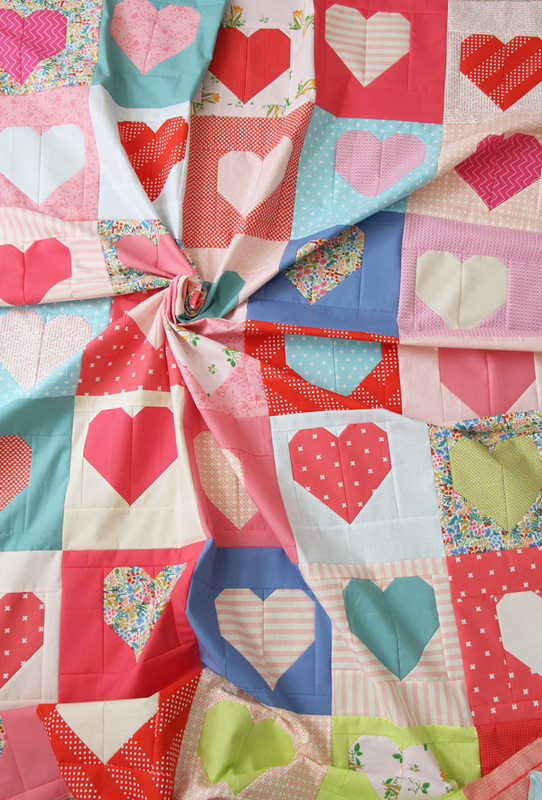 There are actually 4 different blocks in this quilt, so the hearts “bounce” around a bit. I actually started this quilt back in October of last year when I had planned to write a pattern for it to release in January. 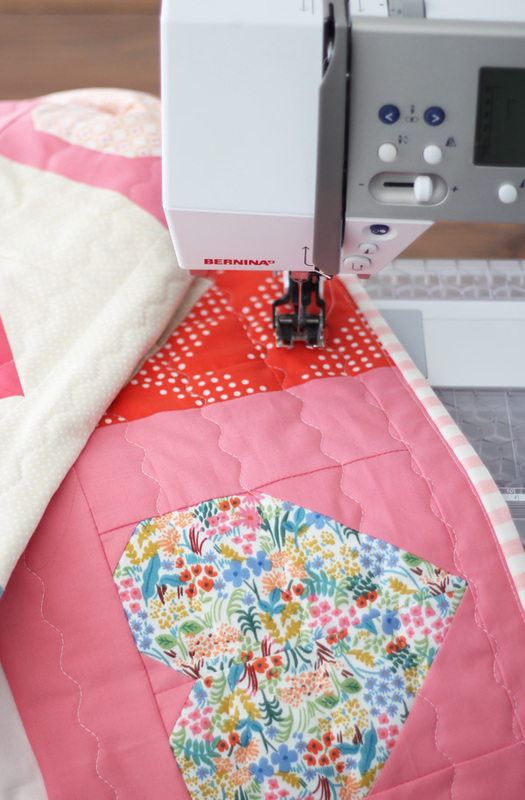 I spent hours and hours figuring out how to make it, writing the pattern, pulling fabrics, making all of the blocks, sewing some of the rows together…and then I just felt stuck. Maybe it was the stress of the holidays, or the overwhelm of so many other heart projects already available (including my own), but either way I decided to scrap this project and give up all that hard work. 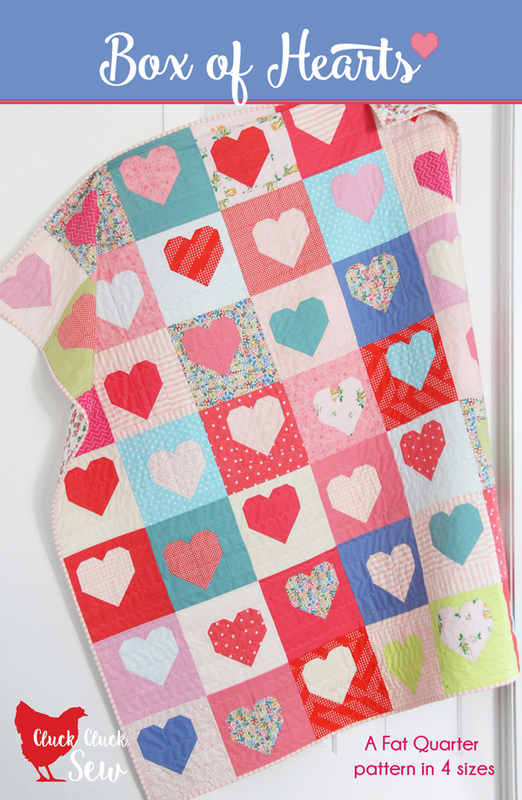 Fast forward 3 1/2 months and I pulled this heart quilt out last week. 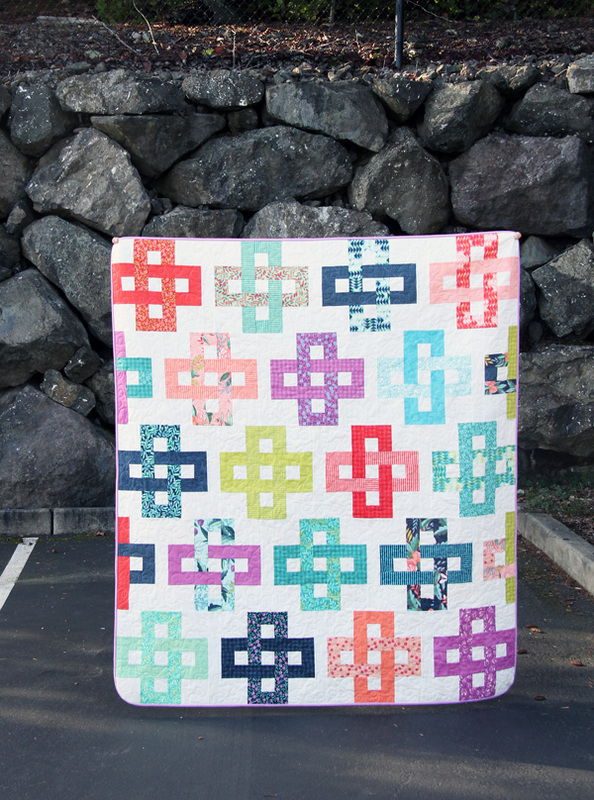 I looked at it with fresh eyes and remembered how much I actually do love this quilt. 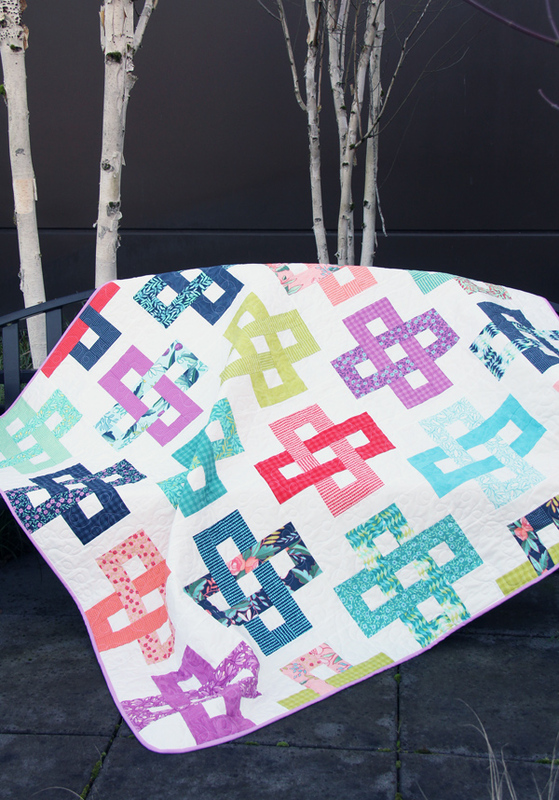 So instead of overthinking it and stewing about it forever, I just finished the quilt. 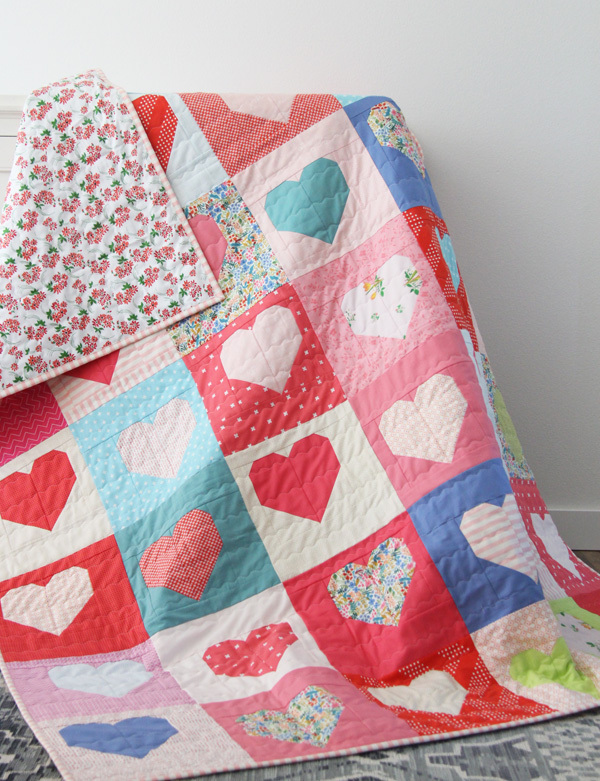 Also since the pattern was 99% done, I finished that too….with 4 days until Valentine’s Day (not that this is a Valentine’s day quilt!). I put this pattern in my shop here on sale for $6 through Valentine’s Day, only available for now as a PDF instant download. 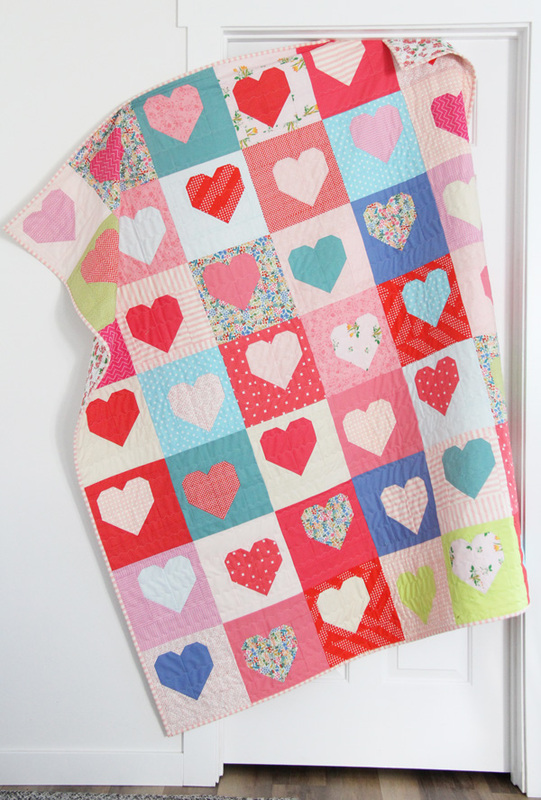 Of course you can still find my heart pattern and my Simple Heart tutorial here. 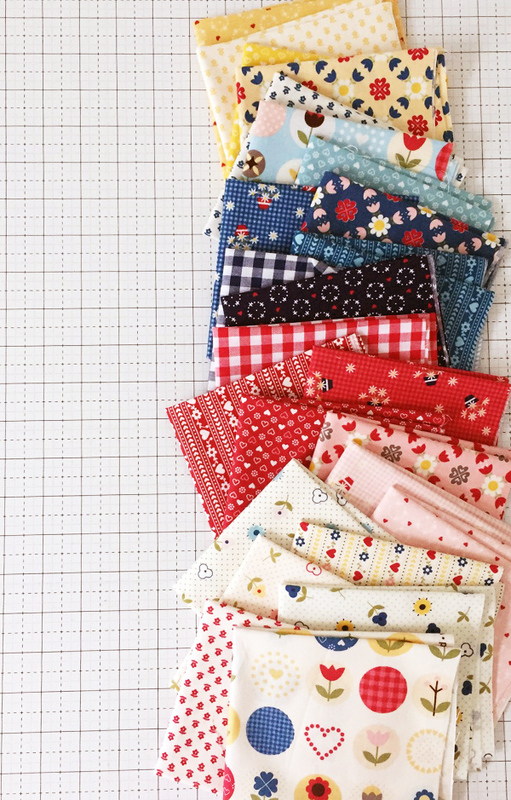 This is just a supplemental pattern if you want the thinking done, so you can grab a stack of fat quarters and just sew! I posted a photo of this quilt top on Instagram and had so many questions about fabrics used, but I could only track down a couple and a few solids that are still available. I chose the top floral print below first, and pulled (almost) all of the other colors from it. Just about everything matches it, so really any pink, red, blue, or even light purple looks good with it. Sorry I’m not more helpful at tracking down all of the prints. The downside of trying to use up my stash is that by the time I use the fabrics they aren’t in stores anymore. Have a great week and Happy Valentine’s Day!